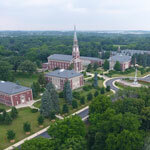 Mundelein Seminary has been engaging the AAAS DoSER project to support our Faith-Science Integration Initiative, a comprehensive revision of our four-year priestly formation program. The driving philosophy of the revision is to ensure that basic facility with scientific knowledge and the ability to discuss it becomes an integral component of our priestly formation program; not only to advance the personal education of the priest-candidate, but also to develop his capacity to accurately and effectively communicate the distinctions between faith and science in his ministry. One focal point for the Initiative is our Fundamental Theology course, required of every first-year theology student. The class integrates science by exploring the question of how the human brain is constituted such that it can process the singular information which would be conveyed via an act of revelation. The traditional Catholic understanding of revelation is thus supplemented by the introduction of basic neuroscience (how the mind receives and processes information). By better understanding the neurological underpinnings of how the human person receives and processes data, the priest is poised to more intelligently discuss such concepts as religious thought and experience, which are foundational to all topics in the discipline of his theological studies and pastoral ministry. A second arena in which we are implementing the Faith-Science Initiative is within the “School of the Good Shepherd”. The School, required of all second-year theology students, is designed to help prepare them for public ministry as they begin transitioning from a more classroom-focused pedagogy to greater engagement with parishioners in actual parish settings. We are integrating science into the School by the inclusion of a module focusing on the rudiments of key concentrations in the physical, biological, and information sciences. As part of their parish ministries, students are asked to design a project in which they engage parishioners in a dialogue about science and faith. Finally, we are actively planning to host “Science at the Seminary,” a campus-wide event in March, open to the general public, exploring the question: “What Makes Us Human?” Our keynote speaker is anthropologist Dr. Robert O’Malley who will discuss insights gleaned from current research regarding the defining characteristics of Homo Sapiens (and whether such characteristics even exist).